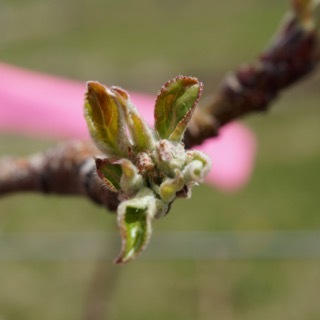 20-April, 2016 (Wednesday) Fruit Twilight Meeting at The Big Apple Farm, 207 Arnold St., Wrentham, MA. 5:30 PM. In cooperation with Rhode Island Fruit Growers' Association. 1 pesticide credit will be offered. Light dinner will be served. $20 meeting fee. Contact: Jon Clements, 413-478-7219. Pre-registration is not necessary. 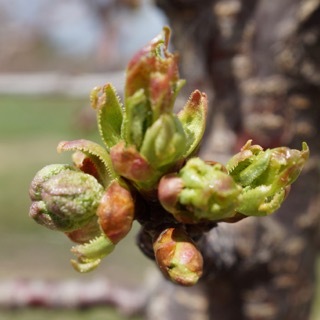 • I also want to remind everyone that we (Extension specialists in New England) compiled an update to the 2015 New England Tree Fruit Management Guide. It, along with the 2015-16 New England Tree Fruit Management Guide (which is largely unchanged from 2015), is available here. 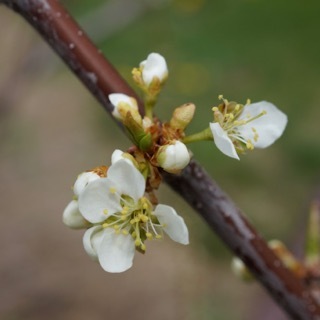 these test pluot selections are the only stone fruit with any bloom (to date, there may be some cherries still to come) at the UMass Orchard, 19- April; note however some missing petals, I suspect there is some cold damage (don't think they have fallen off yet) and un-emerged buds, but I can see a good, green style emerging (particularly evident in flower on right); these pluots are going to be worth lots of money this year (if I don't eat them)! "As far as insect control goes, all that is needed is control Oriental Fruit Moth at least for the first and possibly second generation depending on the amount of pressure. Both Lesser and Greater Peach tree Borers should also be controlled. Scale and aphids should be monitored and controlled if needed, however if insecticide use is minimized this should not be an issue as beneficial insects would likely keep them in check. Herbicide programs should also be maintained to help control voles and to keep out broadleaf weeds to prevent the buildup of plant bugs. Everything is geared toward protecting the tree and minimizing pest pressure for next year’s crop. Hope this helps." If you have a magnifying glass (10x is good) and you want to look for winter moth caterpillars, attached are a couple of pictures to help. 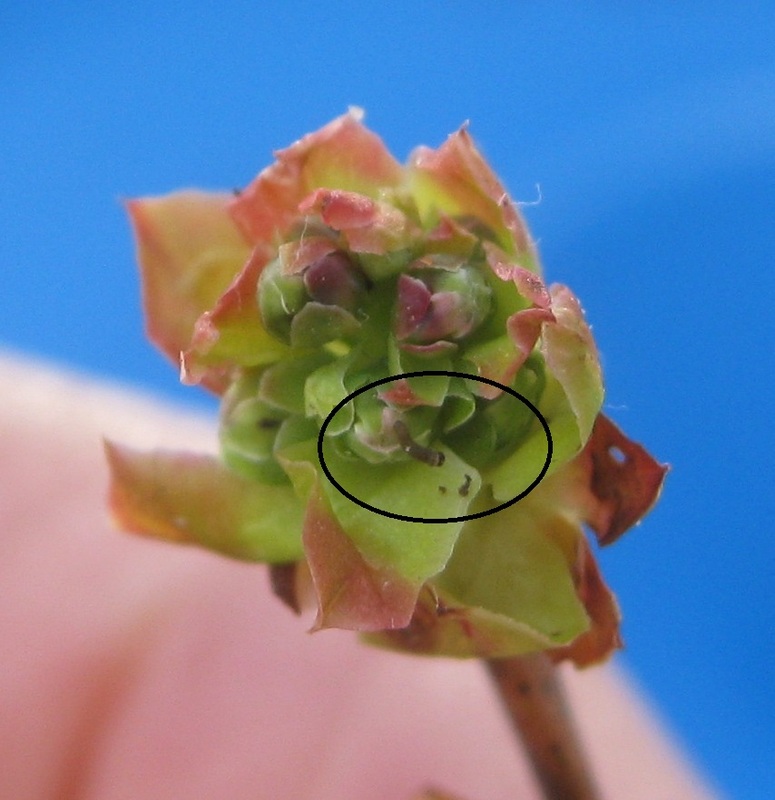 Caterpillars are inside buds now, so to see winter moths, buds need to be peeled open. If a bud has caterpillars it is easier to find frass (insect poop) than caterpillars. Frass looks like small flecks of brown-black pepper in blueberry buds. In apples the frass can be reddish-brown to black. At URI's East Farm we sprayed March 30 for winter moth. We did not get very good control - though we don't know how many caterpillars would be there if we didn't spray. I think our poor control is due to winter moths hatching over a long period due to cool weather once eggs started hatching around March 27. Rain and snow washed off insecticide and the insecticide didn't last through the entire time eggs were hatching. 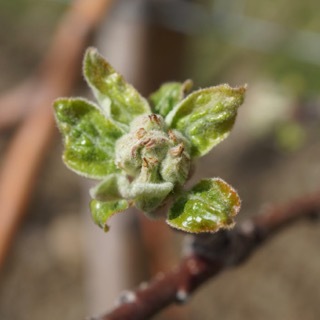 We intend to spray apple trees and blueberries this coming week once fruit buds are at the tight cluster bud stage. Attached are pictures of apple and blueberry tight cluster. Peaches. The chances of a peach crop are very low. 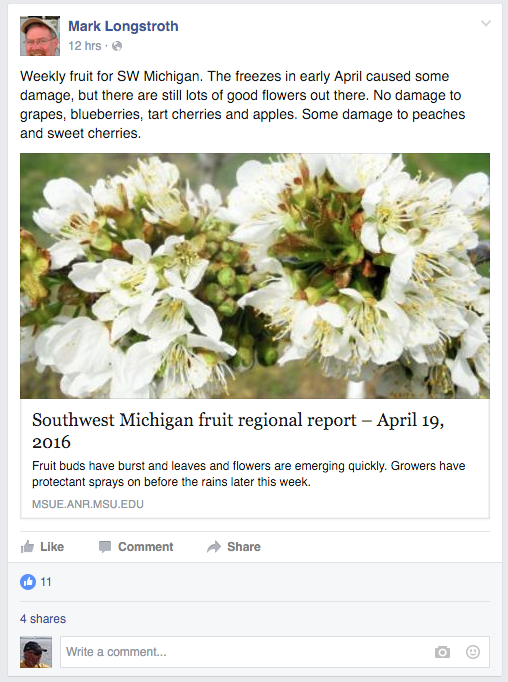 Unless there are blossoms on a tree, there is little point in applying fungicides for brown rot. 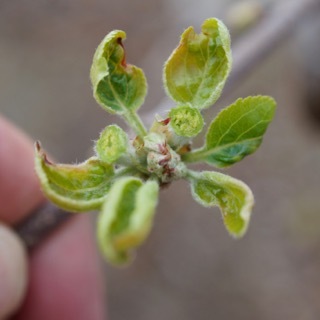 It’s still possible to get some stem infections, and for old cankers to reactivate, but this should not cause significant damage. 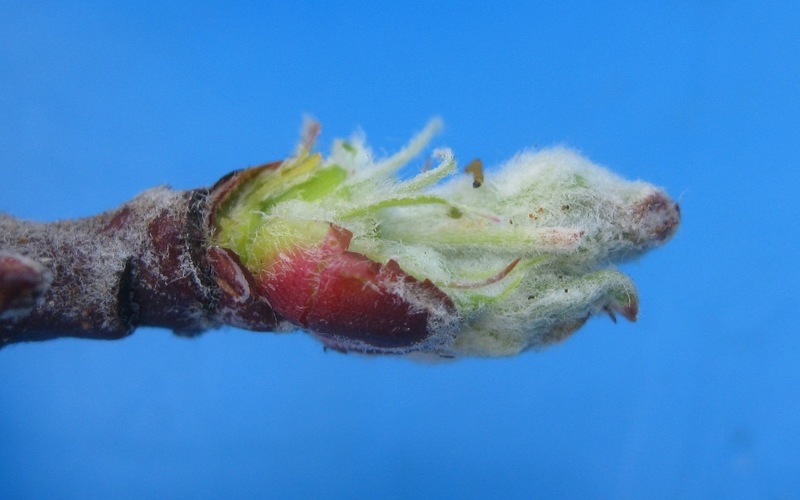 A single application of captan or another relatively inexpensive fungicide should be sufficient to deal with peach diseases. 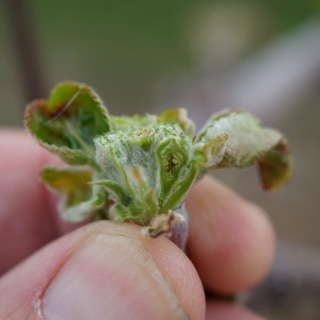 Scab spore maturity. This week's ascospore maturity numbers are as follows: In the squash mounts we are seeing 36% of the fruiting bodies sampled containing mature spore. The Petri plate assay came in with 27 spore observed and, most interestingly, 604 spore counted in the funnel trap. 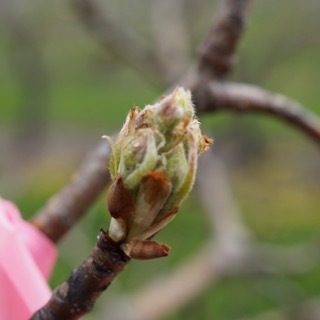 We did not check the two-fan trap as there has been no rain event to cause spore to release in the orchard. This extended dry spell we have been experiencing (more than seven days in a row at many locations) has slowed the maturity process for the ascospores this season. If we continue to see this dry weather, there is a chance we will be looking at a longer overall scab season this year. In the immediate future, however, you should be thinking about the first infection event of the season which will be coming up with out next rain event which, for Belchertown, looks like it might be this Friday with rain predicted to begin in the wee hours of the morning lasting through the day. I was recently reminded that in addition to the rain itself, the timing of that rain does play a factor. 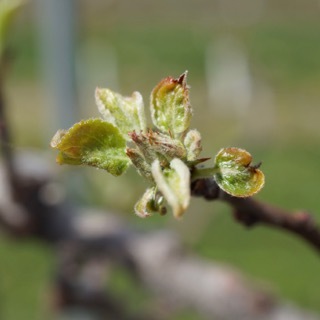 So, as I see it, in a low inoculum orchard, you can pretty safely hold off on your first spray until the next rain event after the one predicted for Friday. Those of you who have had scab in the past may want to get out there and get covered. Or you can use a post-infection approach. Spray post-infection only in blocks that have a history of low scab pressure. The risk of infection remains relatively low, at least into tight cluster, in those blocks. Always apply the post-infection fungicide with captan or an EBDC. Of course, we recommend this for all sprays anyway – just a reminder. Do not stretch the post-infection interval. Spray as soon as possible after the start of infection. Make sure spraying can be finished within the post-infection interval, for most fungicides no more than 48 hr. Spray full rates. Do not scrimp on fungicide. Get good coverage. That means a calibrated sprayer, no wind, spraying as dilute a volume as possible. If these rules can’t be met, it’s better to go with a protectant program, even at the risk of applying an unnecessary fungicide spray - better that than scab infections or resistant scab. • If you are not planting trees, you should be during this dry weather. Earlier planting is better. 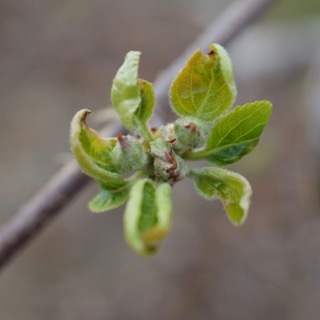 The next Healthy Fruit will be published on Tuesday, April 26 or thereabouts, 2016. As always feel free to get in touch with any member of the UMass Fruit Team (http://extension.umass.edu/fruitadvisor/team-members) if you have questions or comments.